For the past few years, the Parka has been the Go-To-With-Everything outerwear trend and has been seen on the streets, on the celebrities, and on the runways. This makes sense given how cold the winter months have been… Parkas are insanely warm & extremely versatile, making them the most practical outerwear choice. With the Purr-fect Parka, Fashion truly meets Function. My favorite parkas are the Military Parkas, in washed-out green, with fur trim, and slightly over-sized. This Parka Trend crosses genders and all ages- in fact, Parkas are cutest on Little Ones! With the popularity of Parkas, there are just as many pint size options on the market right now as there are adult ones. I am currently obsessed with buying a Parka for everyone in my family, which is the purr-fect outerwear choice right now as the military trend continues in outerwear into the spring season. I think we would all be super adorable and hip wearing similar military green Parkas- though perhaps a little corny. When there is a trend for the whole family, I love when my son is a Mini Me- don't we all?! This Color Me Whimsy Cheetah Army Jacket is the Purr-fect option for your Little One. 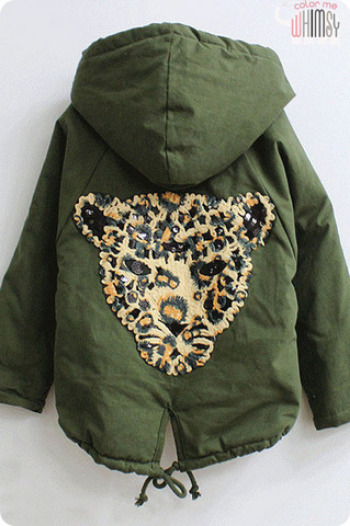 Not only is this Parka hip in washed-out green and slightly over-sized, but it is also on trend for Kids with the Oversized Cheetah Appliqué on the back with black sequin. This Cheetah Army Jacket is Unisex and would be just as cute on a boy as a girl! This Scotch and Soda Canvas Parka has a detachable inner jacket, which will come in handy when the days get colder, and makes it the perfect Parka option going into the spring months when the days get warmer. With its reflection details making sure the little ones get Noticed, it is a Practial and Safe choice for Moms and a Cool choice for Kids. This Zara Parka with Hood will Keep your Little One Toasty in the Cold Months. It has a detachable fur lining which makes it perfect for the unpredictable weather ahead. Again, this is a Boys Parka, but as you all know I love the Unisex Trend, and the Classic Design of this Parka makes it just as Cute for a Girl as it is for a Boy.